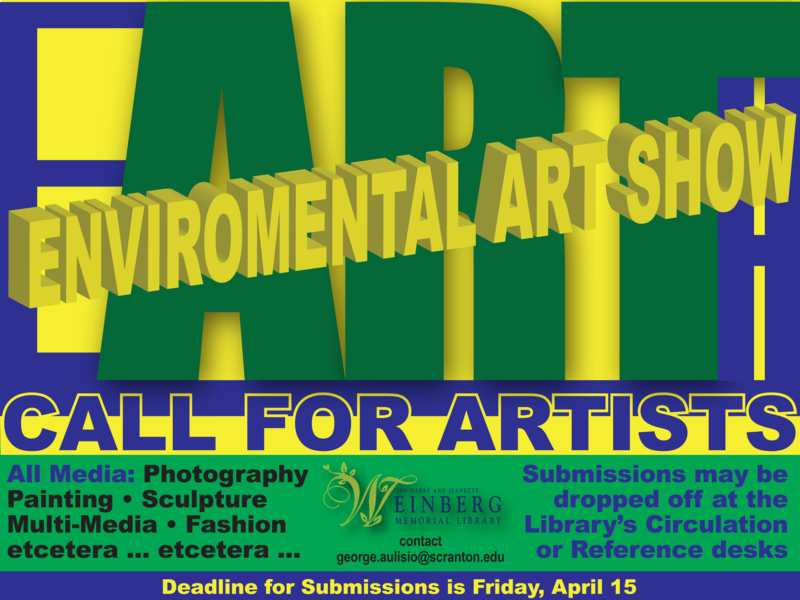 Environmental Art Show – Call For Art! Comments Off on Environmental Art Show – Call For Art! 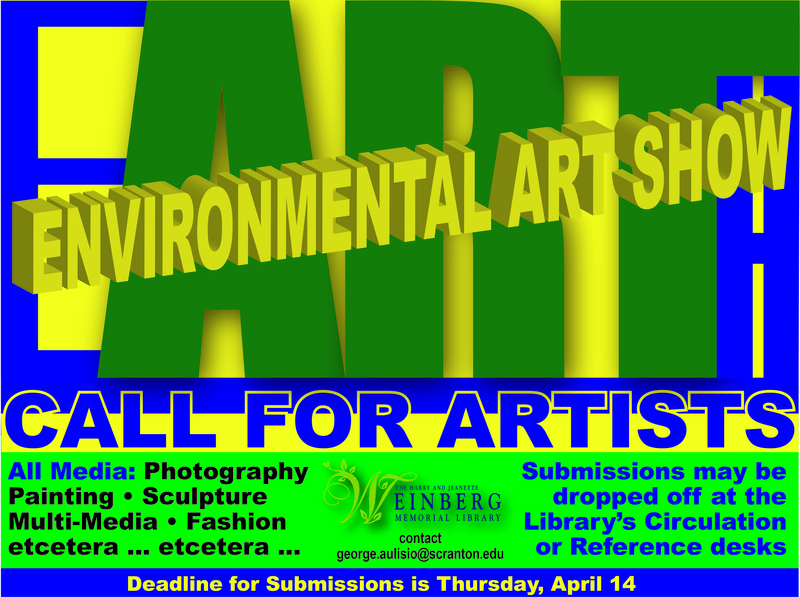 The library is seeking submissions for the 6th Annual Environmental Art Show. The art show will be held from April 15th until the 21st. The purpose of the Environmental Art Show is to promote the natural beauty of our environment and the ideal practice of sustainable living through artworks of all types, including painting, photography, repurposed goods, sculpture, and more. The show is comprised entirely of University of Scranton student, staff, and faculty submissions, so please consider contributing! The deadline for submissions is set for Thursday, April 14, 2016. All works of art can be dropped off at either the circulation or reference desks of the library. All artwork is returned after the exhibit has closed. 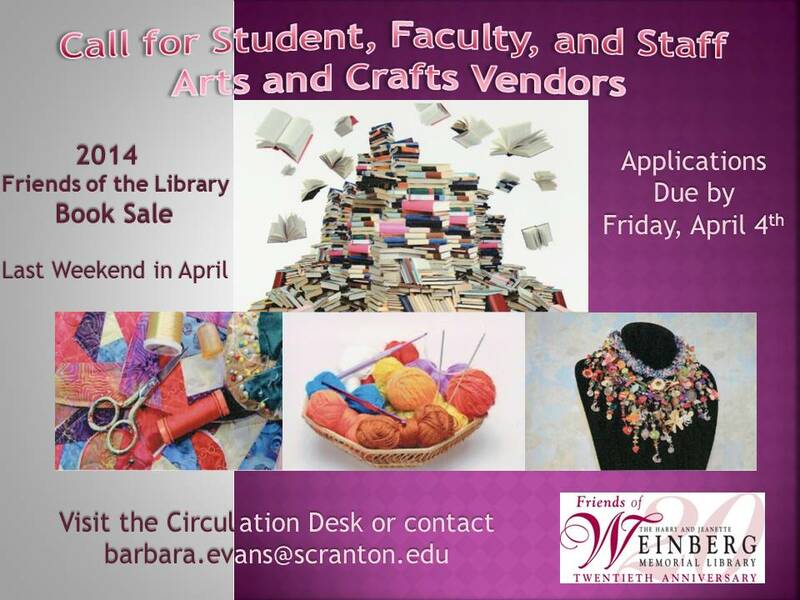 The Friends of the Weinberg Memorial Library are currently seeking applications from University of Scranton student, faculty, and staff Arts and Crafts vendors for the 2014 Annual Friends of the Library Book Sale. The annual Friends of the Library Book Sale will be held in the Library’s 5th floor Heritage Room Friday, April 25th (preview sale for members and students), 4pm-9pm; Saturday, April 26th, 9am-9pm, and Sunday, April 27th, noon-4pm. Vendor applications are due by Friday, April, 4th. Vendors will be notified of acceptance by Friday, April 11th. Approval of applications is space permitting. The Friends of the Library accept only vendors who are selling items that they have created themselves and reserve the right to reject any applicant who does not meet these criteria. The table space fee is $5.00 per day due prior to table set-up each day with a discounted fee of $10.00 for table space for all three days. The Friends of the Library are not responsible for the loss or damage to any items. The vendors are required to properly staff their tables and are responsible for the sale and security of their merchandise. For more information or to fill out an application, please visit the Library’s Circulation Desk or contact Barb Evans at (570) 941-4078 or barbara.evans@scranton.edu. Comments Off on Break a Leg, Players! It’s opening night for the University of Scranton Players’ production of the musical She Loves Me, with the Weinberg Memorial Library’s own David Hunisch performing the role of Ladislav Sipos and Ian O’Hara playing in the pit. To the entire cast and crew, from your friends and fans at the Library: break a leg! Opening Reception for the Environmental Art Show, Monday, 7pm! Comments Off on Opening Reception for the Environmental Art Show, Monday, 7pm! Opening Reception for the Environmental Art Show! 2 Comments on Opening Reception for the Environmental Art Show! The Library will be hosting its annual Environmental Art Show in conjunction with the University’s celebration of Earth Week. The Exhibit has a grand opening and reception which will be held on Monday April 16 at 7pm to approximately 9pm. Please come stop by to admire the Artwork, you will also have the opportunity to discuss the various pieces with the artists themselves. Refreshments and snacks will be served! 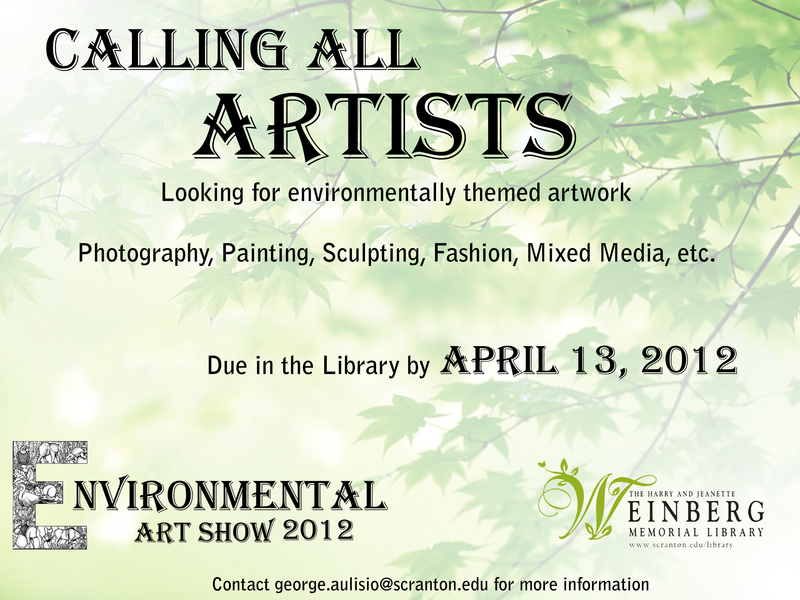 The Library is still accepting submissions for its annual Environmental Art Show! You now have until Sunday April 15th to bring your Environmentally themed artwork into the library. The purpose of the Environmental Art Show is to promote sustainability through outreach and artwork. 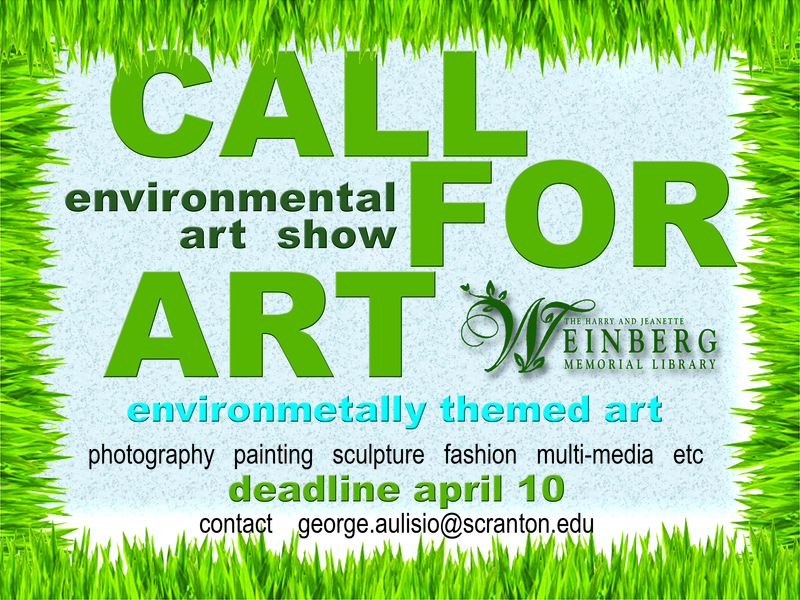 By submitting a piece (or pieces) to the Environmental Art Show you are showing your support for the Environment and letting the local community know that The University of Scranton cares about Sustainability. Environmental Artwork can be broadly interpreted and includes, but is not limited to: Photographs oil paintings, water colors, acrylics, mixed media, recycled goods. Environmental subjects include, but is not limited to: flowers, nature scenes, trees, animals, environmental degradation and destruction, etc. I strongly urge you to show your support for sustainability and submit artwork to the Art Show. In honor of Earth Week, the library will be hosting its 2nd Annual Environmental Art Show. The purpose of the Art Show is to promote sustainability and raise awareness about environmental issues. In addition, the exhibit will showcase the talents of the University community. 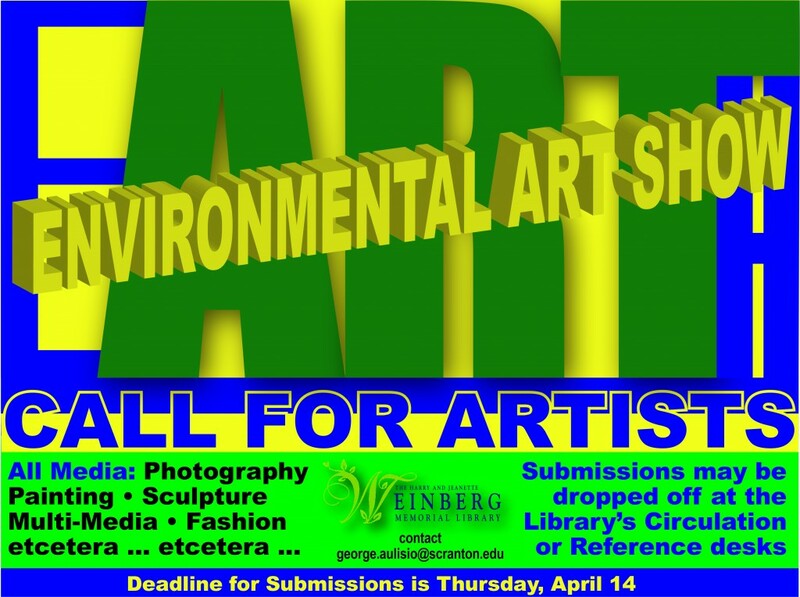 This is an open call for artwork, so any student, staff, or faculty member interested in submitting to the Environmental Art Show is welcome. All types of environmentally themed art are welcome, this includes photography, painting, sculpting, graphic design, altered images, fashion, and any other area of creativity. Submissions must be environmentally themed. Examples of environmentally themed art include nature scenes, wildlife, humanity’s effect on the environment, clothing made from recycled or re-purposed goods, and creative messages about sustainable issues. For photos from last years exhibit please see our flickr album. Any and all questions should be directed to george.aulisio@scranton.edu. There is no limit on submissions. However, not all submissions will necessarily be displayed. All artwork will be returned by the end of the semester. Submissions are asked to be ready for display (within reason). This means, for example, that photographs and paintings are matted or framed, any artist who has special display needs should contact George Aulisio. Please bring your submissions to the library’s Reference Desk or Circulation Desk before April 13, 2012. 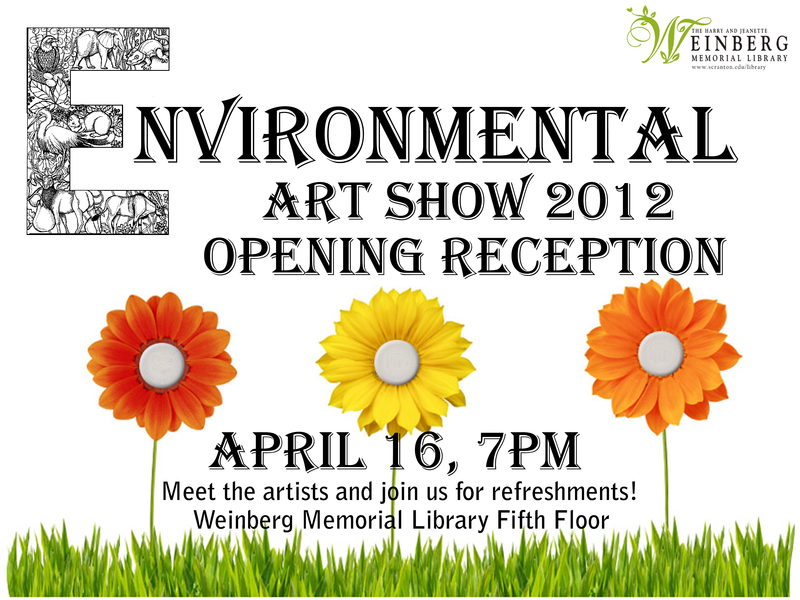 The Environmental Art Show will be held in the Heritage room and runs from Monday, April 16 until Wednesday, April 25. There will be an opening night reception on the evening of April 16th for a chance to meet the artists and discuss their artwork. For any additional questions please contact george.aulisio@scranton.edu. Welcome (back), Bonnie and George! 1 Comment on Welcome (back), Bonnie and George! It’s been a busy year in the Library, with two important Library staff transitions. You may recall that last year at this time, we bid a fond farewell to Katie Duke, Coordinator of Information Literacy, and welcomed George Aulisio as our new Part-Time Reference Librarian. This year saw us searching for a Librarian to take Katie’s place, and our very own Bonnie Oldham turned out to be the best candidate for the job! This meant Bonnie’s position as Distance Learning Library Services Coordinator became vacant, and after yet another search (this time with one of the largest applicant pools ever seen at the Library), our joy was doubled when George emerged as the top candidate for this position. And so, we welcome (back) Bonnie and George, each in a new job role — Bonnie as Information Literacy Coordinator and George as Distance Learning Library Services Coordinator! Bonnie was born in Harrisburg, PA, and raised in the suburbs of Philadelphia. She has lived in Georgia and New Jersey, and twenty years ago she returned to Pennsylvania, where she has remained ever since. She currently resides in Shavertown. She received her undergraduate degree (A.B.) in History from Chestnut Hill College, her Master of Library Science degree from Kutztown University, and her Master of Science in Organizational Management degree from Misericordia University. 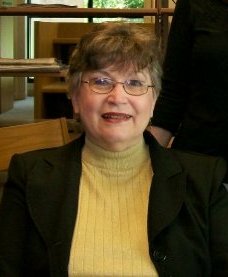 Bonnie brings 19 total years of experience in academic libraries to her new role as Information Literacy Coordinator. George grew up in Old Forge, PA, and still calls Old Forge his home. George received his Bachelor of Arts in Philosophy degree from Bloomsburg University, his Master of Library Science degree from Drexel University, and is currently pursuing his Master of Liberal Arts degree at the University of Pennsylvania. If you are a student or faculty member in the Occupational Therapy, Physical Therapy, Exercise Science and Sport, or Nursing Departments, then Bonnie is the Librarian you will want to get to know. She is the collection development and information literacy liaison to these departments, just as George is the liaison to the Philosophy, Communication, Mathematics and Computer Science Departments. Both are especially looking forward to working more with faculty and students in their collection development areas. In her free time, Bonnie enjoys cooking and doing crafts – for example, five years ago she made her daughter’s wedding dress. George, who has a deep thirst for knowledge, spends much of his free time pursuing his studies; however, he also enjoys yard work, including cutting the grass and trimming the trees. Both enjoy reading (what librarian doesn’t? ), and both can be found sharing the same 2nd floor office in the Weinberg Memorial Library. George can be found in the Library most evenings of the week, Sunday through Thursday, while Bonnie is easiest to find during the day, Monday through Friday. Feel free to stop by and say hello to them – they both welcome visitors! 1 Comment on Farewell, Professor Duke! This is a summer of change here at the Weinberg Memorial Library. One such change is the departure of our esteemed Coordinator of Information Literacy, Prof. Katie Duke. Katie’s retirement after 23 years of serving the Scranton community is the beginning of the next set of adventures life has in store for her. Students and faculty in the Biology, Chemistry, Computer Science, Earth Science, Mathematics, Nursing, Philosophy and Physics Departments know Katie for information literacy sessions in these subject areas which have always been exciting and useful, chock full of knowledge and gusto. The entire university community has Katie to thank for an Information Literacy program that is lauded and valued by so many, both within the university community and those outside of it. Her love for the research process comes out in all that she does, and for this she will be fondly missed. Thank you, Katie, for your years of love and service!